The Syrian civil war is the greatest humanitarian disaster of our time. Within the four years that it has been raging, it has displaced over eleven million people. Every day thousands try to escape the ongoing conflict. Over 5 million people have fled to nearby countries like Lebanon, Jordan, Turkey, Iraq and Egypt in hope to find quick shelter and safety. In Lebanon alone the UN refugee agency (UNHCR) has registered over 1.2 million refugees, constituting a fifth of the population of the small country. The strains are becoming increasingly apparent, sectarian tensions are rising. The majority of the refugees that reach Lebanon are women and children. According to the UN, over half of all Syrian refugees are under the age of 18. Most have been out of school for months, many for years. “Displaced” tells the stories of the women and children I met in Lebanon in September 2014, living in makeshift shelters built by the UNHCR around the Bekaa Valley, close to the Syrian border, and in safe houses in Beirut, provided by the local NGO Makhzoumi Foundation. 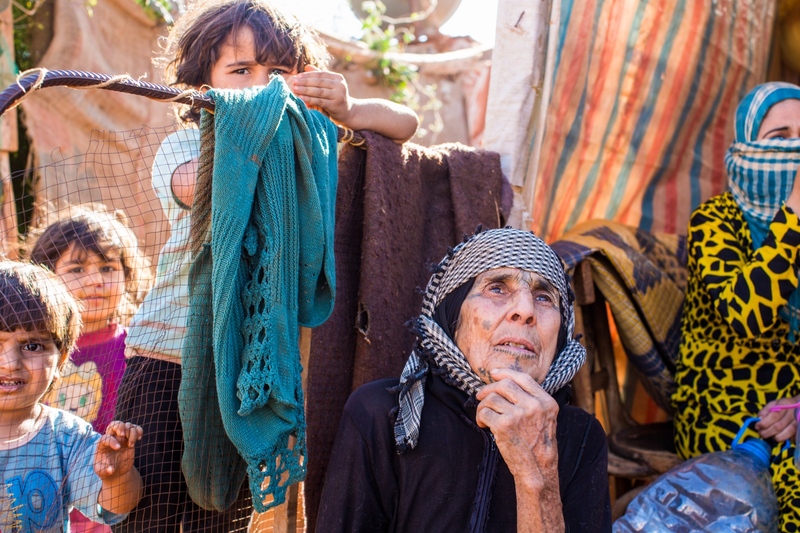 Bekaa Valley, LEBANON, September 5, 2014: Aida el Issa (79, center), and her grandson Amjad (7, center left) fled from Syria over night three years ago, when news occurred that their village was going to be bombed. They don’t know what happened to their house since then. 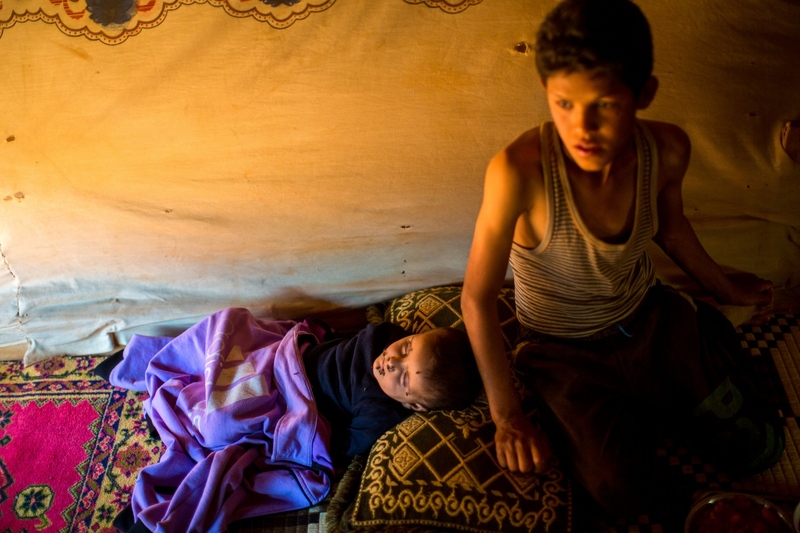 Bekaa Valley, LEBANON, September 5, 2014: Syrian refugee Jassem, 12, watches over his little brother, 3, as he sleeps in their tent in an informal settlement in Lebanon's Bekaa Valley. Jassem and his parents fled Syria in late 2011. They have been living in makeshift shelters ever since. The Lebanese government has refused to allow traditional refugee camps for Syrians in Lebanon, so many live in temporary shelters across the country. Bekaa Valley, LEBANON, September 5, 2014: Children walk through an informal settlement for Syrian refugees in Lebanon's Bekaa Valley. UNICEF reports that 6.5 million Syrian children have been affected by the Syrian war. 2.8 million children are no longer in school and more than one million are living as refugees in neighboring countries. 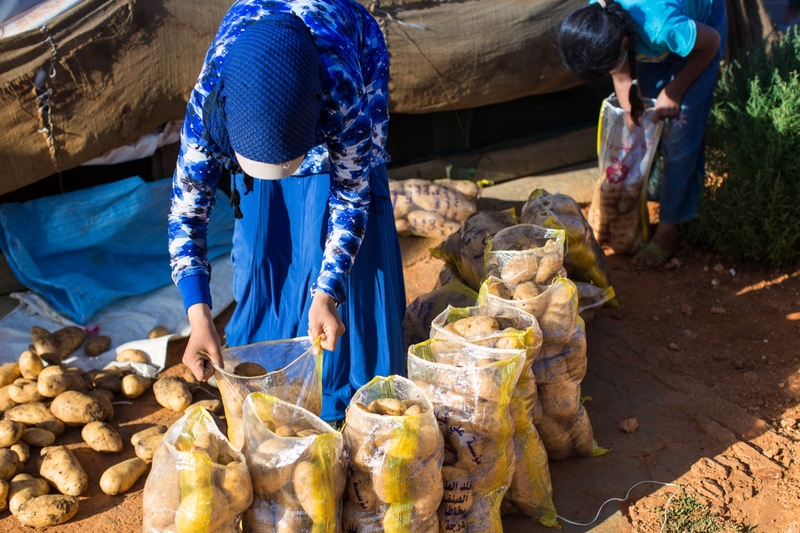 Bekaa Valley, LEBANON, September 5, 2014: Imarat Anwar, 26, is one of many Syrian women who works as a potato plucker, earning only 5 USD per day. Female refugees mainly work in agriculture, while men try to find work in construction, carpentry or as carriers. 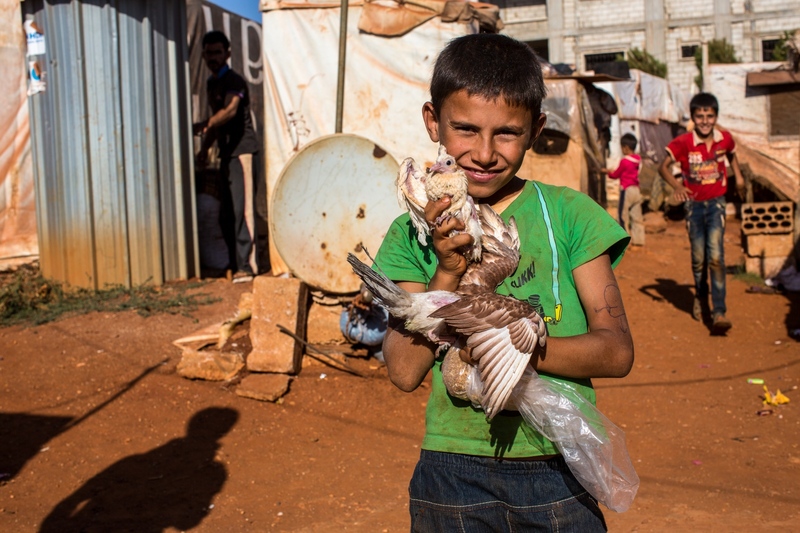 Bekaa Valley, LEBANON, September 5, 2014: Ahmad (10) plays with a bird that he caught. His brothers and father are looking for work in the village of Zahle, while he helps his mother with all kinds of tasks as she is raising three toddlers. 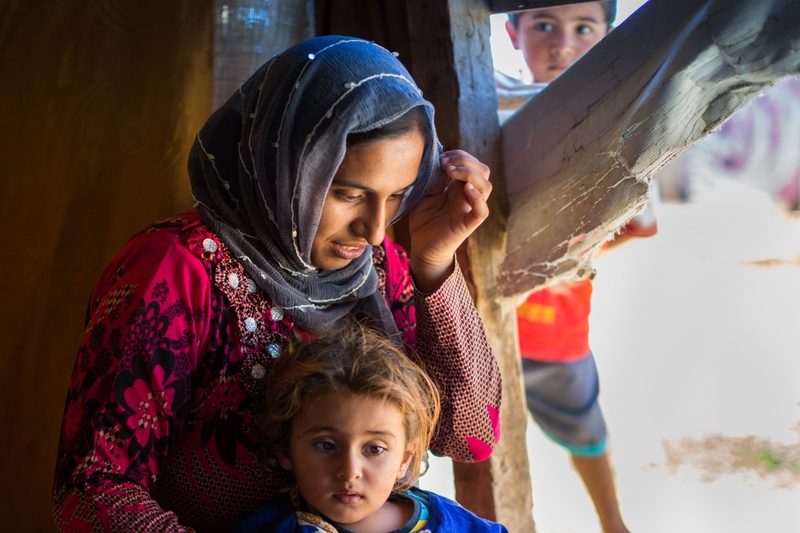 Bekaa Valley, LEBANON, September 5, 2014: Fadile (35) is mother of eight children; six girls and two boys. 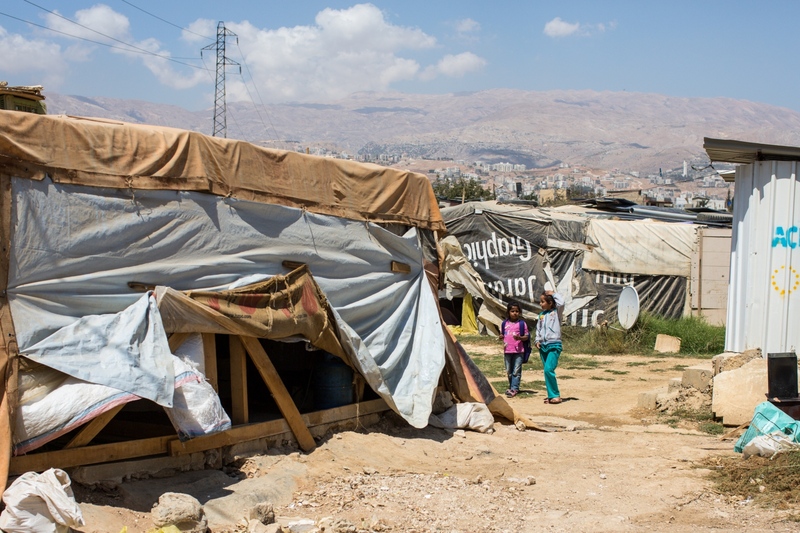 Most of the refugees living in Lebanon's makeshift shelters are women and children. 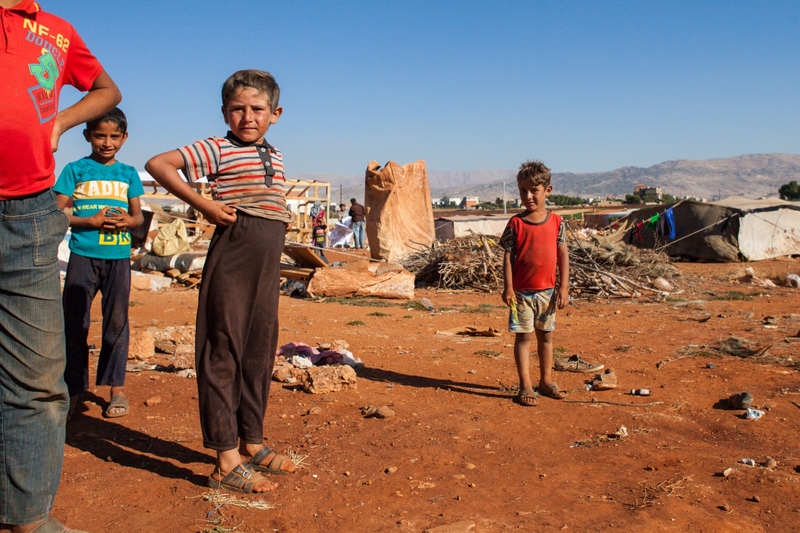 Bekaa Valley, LEBANON, September 5, 2014: Boys play in their destroyed settlement. On September 9, 2014, the camp has been destroyed entirely. Ibrahim, the chief of the village reckons it was the Lebanese army who came in search for hidden Daesh/ISIS fighters and weapons. Official reports claim it was unidentified masked gunmen. Sectarian tensions are growing in Lebanon and violence erupted after Lebanese soldiers have been abducted and killed by Daesh fighters in November 2014. 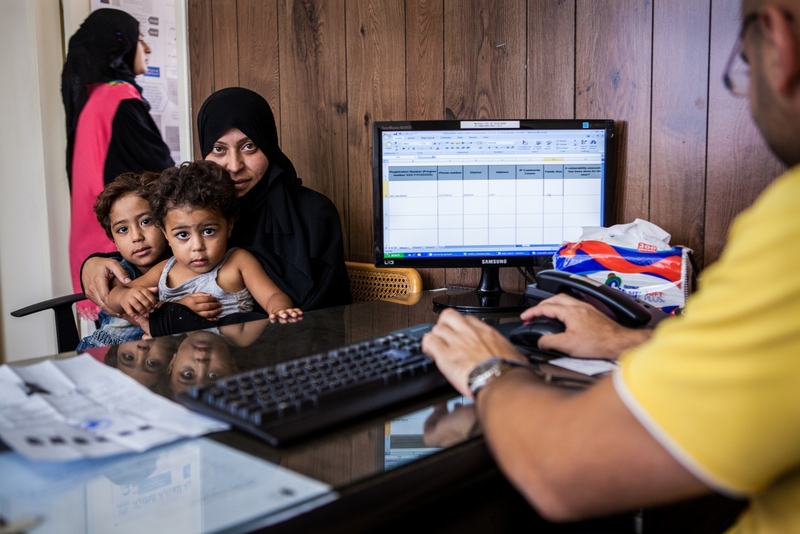 Beirut, LEBANON, September 22, 2014: Alissa Amad Mohammad Ali (35) and her children, Rona (4), and Amal (2) are receiving an vulnerability assessment at Makhzouni Foundation who collaborated with UNHCR. 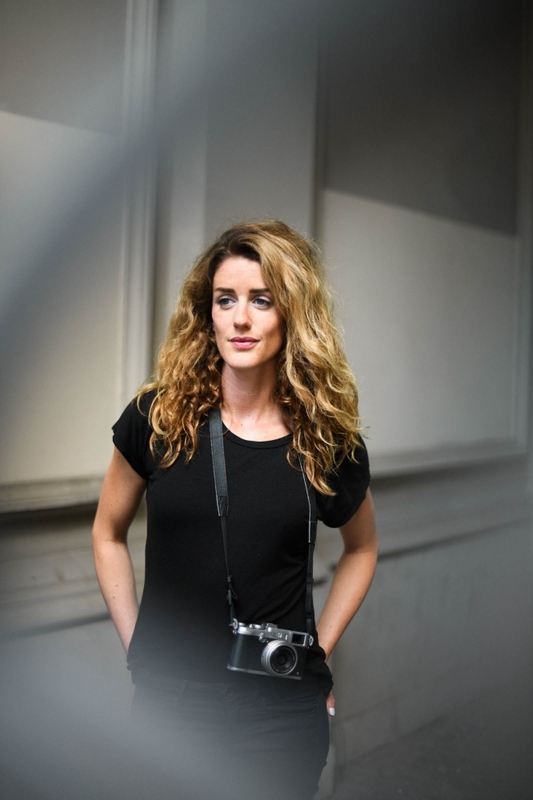 Alissa has six children and is a single parent since her husband went missing in Syria two years ago. Beirut, LEBANON, September 19, 2015: Syrian refugee families share a safe house in Beirut. Up to five families share an apartment in a secret location. 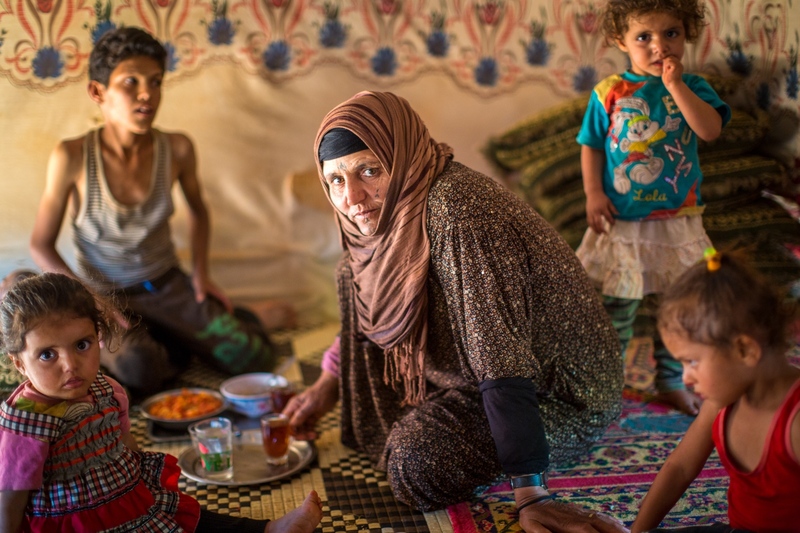 Bekaa Valley, LEBANON, September 5, 2015: Amina with four of her five children in their tent. She is the center of their lives as their father or other male figures are absent. Many refugee women are single parents as their husbands have gone missing or been killed in the Syrian war.